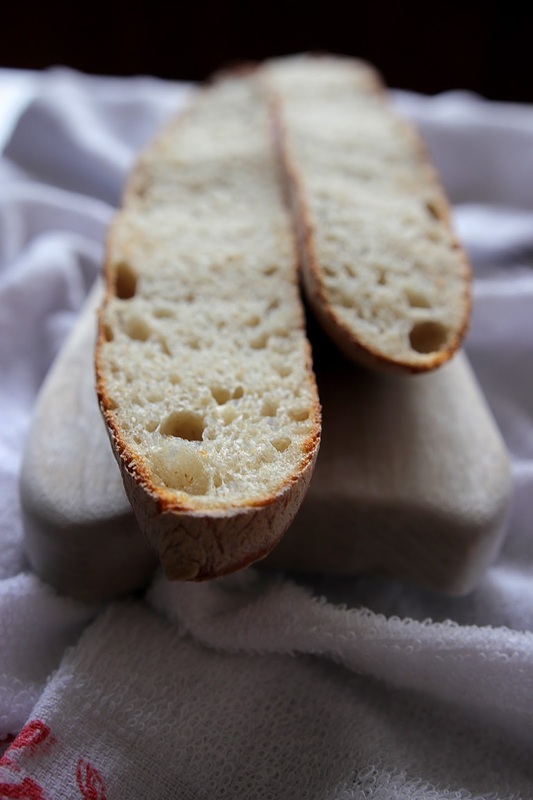 Take the sourdough yeast from the fridge and feed it with 80g of water and 80g of bread flour. Let the mixture sit out in a cool environment over night. I left mine in a wine fridge. Mix the flours, water and sea salt in a large mixing bowl until a shaggy dough is formed. Scrap down the sides of the bowl to incorporate the flour until there is no more dry flour. Cover the bowl and place the mixing bowl into the fridge and leave it till the next day when you are ready to make bread. Take the refrigerated dough out. Let it sit on counter top for 30 minutes. Measure out the required matured sourdough yeast (mature levain) from last evening and spread gently all over the refrigerated dough. Wet your hands before you proceed. 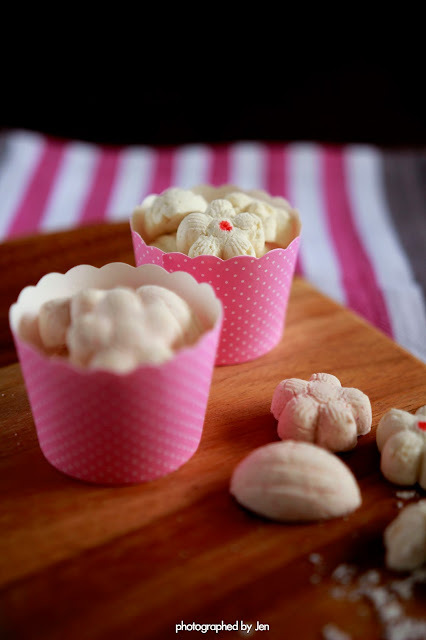 Use your finger tips and dot the surface of the dough to start incorporating the yeast into the dough. Dividing the mixing bowl into North-South-East-West as though you are looking at the compass. Lift gently the dough on the West side of the bowl and fold it over to the East. Then lift the North side of the dough and fold it over the South side. Followed by lifting the West side and fold over the East and then the South side over onto the North. This is 1 complete cycle of folding (I like to call it the compass folding method). Repeat another 4 -5 more sets of folding and you will feel that the dough gaining strength and resisting the pull of your hand as you try to stretch it and it fold over. 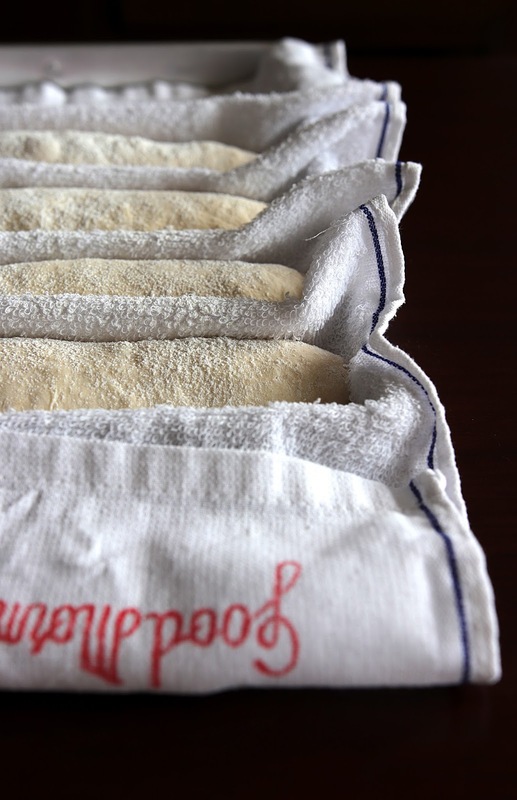 This process allows the yeast to be gently mixed into the dough and it also develop and align the gluten in the dough. Repeat the folding cycle as long as the dough allows you. Do not be forceful and tear the dough. This will destroy the gluten structure. Once you feel that the dough is resisting the fold, go to the next step. Cover the mixing bowl with a cling wrap or a clear shower cap (what I used) and let the dough sit for 30 minutes before you start another cycle of the compass folding. Do only 1 set of compass fold after every 30 minutes for a duration of 2 hours, which is to say a total of 4 sets of compass folds in 2 hours. Wet your hands before folding as it will help to prevent the dough from sticking to your hands as you grab it to fold it over. Observe and feel your dough throughout the 2 hours when you do the compass fold as it will feel less stick to your hands and start to hold its structure right after the folds. After 2 hours, divide the dough into 4 equal portions of approximately 215g each and round them and let them rest for 10 - 15 minutes on the counter top covered with a damp cloth before shaping them. 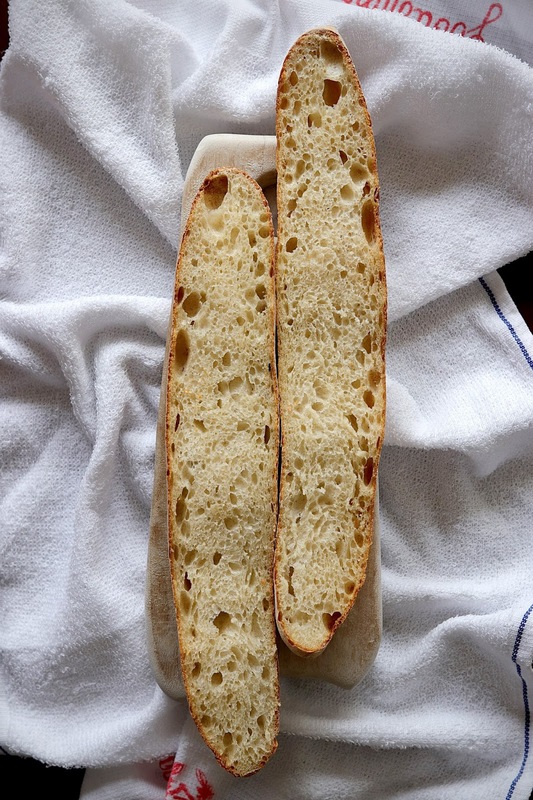 I will let the experts at King Arthur Flour to show you 'how to form a baguette' using their video. Place the formed dough into a baking tray lined with a lint free cloth dusted with rice flour and pull a little of the cloth to form a ridge this will help to hold the shape of the dough and also prevent the baguette from sticking to one another. 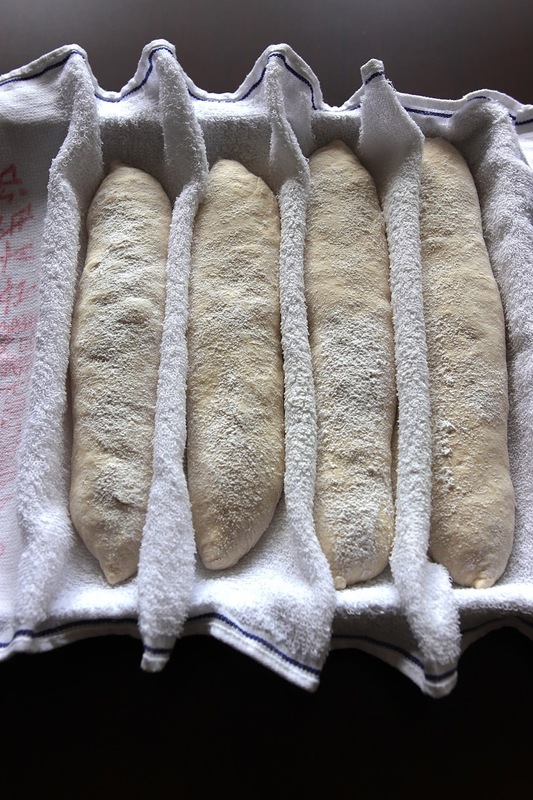 Cover the top of the 4 shaped baguette with another lint free cloth and place the baking into a big plastic bag and let it rise for 2 - 3 hours at room temperature until they are 1.5 times bigger in size. I placed mine into a fridge for 16 hours before baking. This helps to fully develop the flavour of the baguette. When the dough is ready to bake, preheat oven to 300 degrees C (500 F) for 30 minutes with a pizza stone placed at the bottom of the oven and the baking rack in the center of the the oven as it is preheating. Get a pound cake loaf pan and some water in a kettle ready to create steam when the loaf is ready to enter the oven. 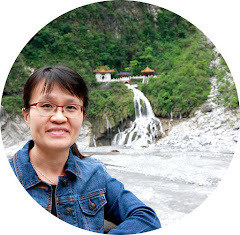 Be very careful from this stage onward, everything is extremely HOT. Use a pair of thick oven gloves to protect your hands. Once the oven is ready, move the pizza stone onto the baking rack which is placed on the center rack of the oven. Boil the kettle of water and pour 1/2 cup of boiling water into the pound cake pan. Then place the pan at the bottom of the oven and close the oven door. 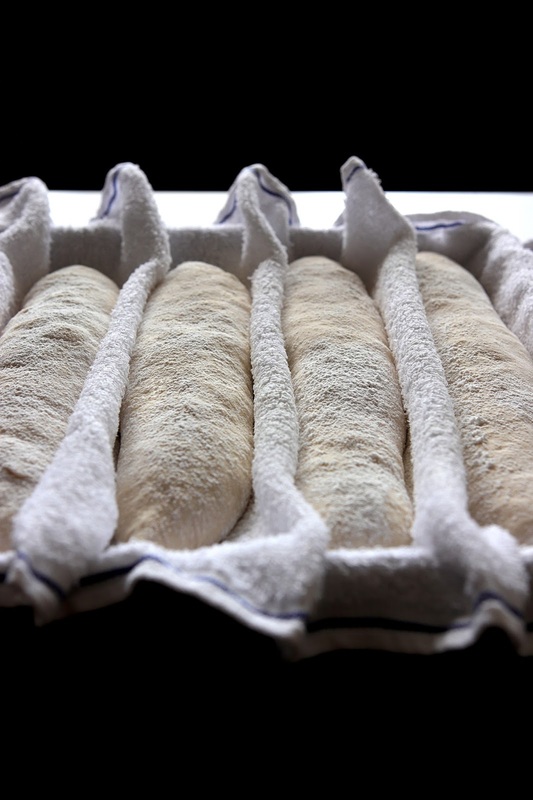 This is to create a hot and humid environment to allow the bread to rise and form a thin crispy crust. While the oven is steaming, the turn the baguette dough onto a pizza peel lined with baking paper. Use a sharp knife or a lame (if you own one) to score the surface of the dough. 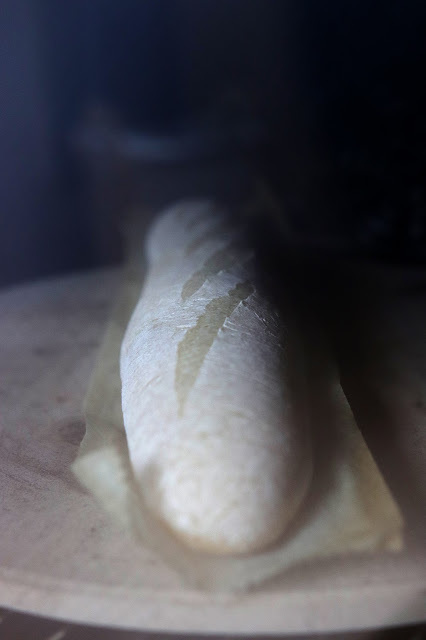 Traditionally, a baguette have 5 slashes cut on its surface. I am still learning how to score a baguette properly and this is one of the good video that teaches how it should be done correctly. Very carefully (Lots of steam will rush out when you open the oven door) slid the dough from the pizza peel with the baking paper onto the pizza stone and bake for 15 - 17 minutes. Remove the pound cake pan that contain hot water after 11 minutes into baking. 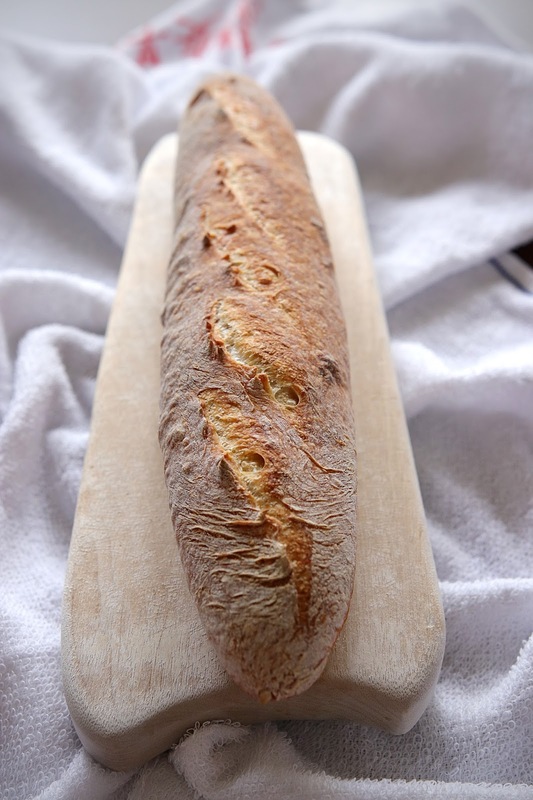 The baguette is ready when the surface of the baguette is golden brown and sound hollow when you tap the bottom of it. 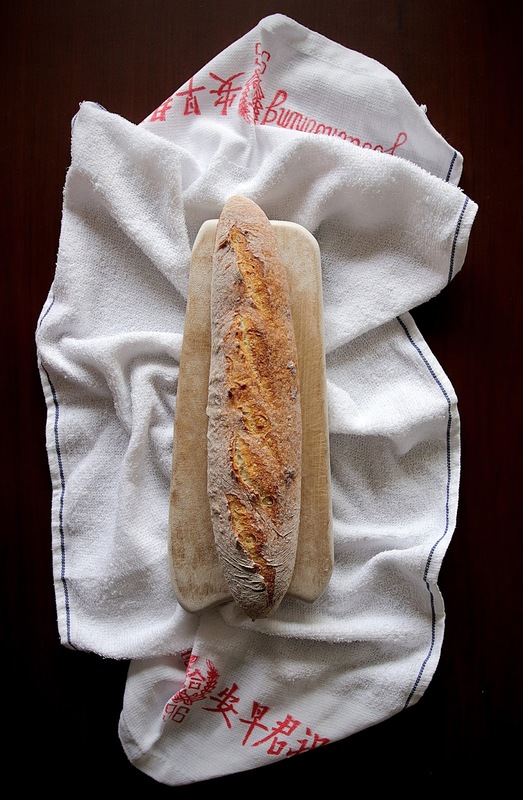 Once baked, transfer the baguette very carefully to an elevated cooling rack to cool for at least 1 hour.